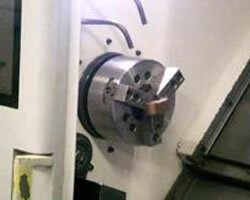 A pre mixed metal powder, meeting your material specifications, is gravity fed into the die cavity using a feed shoe. 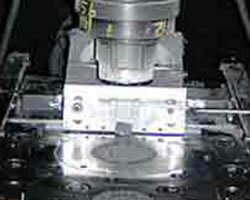 The “green” part is compacted inside the tooling, in most cases to the components final net shape, and then ejected from the die. The irregular shaped iron particles interlock together during the compaction and allow for the parts to be handled in this green state and retain their shape without excessive damage or chipping. ask edd . The force required to compact the green parts to size is typically around 15-50 psi. In this state the parts have a relatively indefinite shelf life due to the lubricant in the powder forming a protective layer on the parts and keeping them essentially rust free. Next step is the sintering operation. The parts are loaded into a sintering furnace that will gradually work through differentiated heating zones until it reaches the 2050 F temperature necessary for sintering and bonding of the iron particles. The furnace chamber is filled with a protective atmosphere generally consisting of hydrogen and nitrogen to assist with de-lubing the parts and protecting against decarburization. 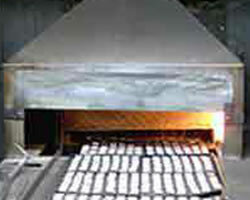 The iron bonded parts then spend 30-45 minutes in a cool down portion at the discharge end before exiting the furnace. In many cases the parts at this state are ready for use and/or assembly at the customer location. Many other value added operations may also be performed to the parts depending on the component requirements. 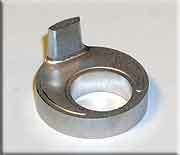 As with any steel part a number of secondary operations are available to finish the component. One of the strengths of TPI is the ability to readily provide a wide assortment of secondary operations such as CNC machining, heat treatment, zinc plating, and many other operations. (see our Services and Capabilities page for a complete list.